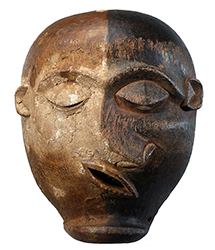 This exceptional, Western Pende mask has been vetted as authentic with evidence of significant age and use. Acquired from Kunsthandel Hermann Sommerhage at BRUNEAF in 2010. 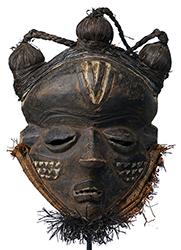 The Western Pende masks below have been vetted as authentic. The masks below were probably made to be sold. PLEASE NOTE: Masks shown with stands on the individual pages are sold with stands. Masks shown with just a post (to facilitate photography) are sold without stands and may be hung on a wall. The Pende people of the DRC are grouped into numerous territorial groups, the two most important being in Kwilu (Western) and Kasai (Eastern) Pende. Several clans are consolidated under the rule of a chief (Djigo) whose main role is that of mediator with the ancestors. Even though the society is matrilineal, the sculptor's profession is transmitted from father to son. Pende art styles vary widely, with a more abstract, geometric style in the east and a more naturalistic one in the central area and to the west. 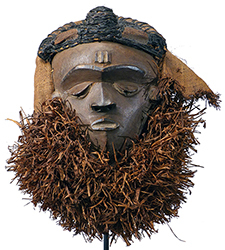 The Kwilu Pende are especially well known for their masks that were originally used for circumcision ceremonies, but later became accessories for a type of popular theater. 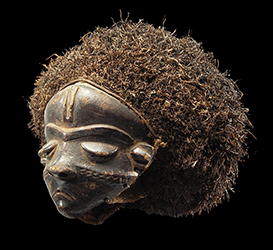 The Kwilu Mbuya masks are characterized by a somber, gloomy expression.